Well from the photo's I think Letizia wore her diamond star earrings,surely she could have worn something else given the ceremonial occasion and she didn't wear any rings. On the other hand, given that she has to shake more than 1000 hands today, maybe it was a wise decision not to wear any rings. That's a valid point and may be the reason as to the absence of her wedding ring and the others. Perhaps, those earrings have special meaning to her. those earrings have special meaning to her. That seems very likely. Perhaps they were a gift from her husband ? I certainly agree, but I believe I read somewhere that the star earrings were given to her by Felipe for a special personal occasion and that he loves seeing her wear them. Who really knows. If true I can think of quite a few "personal" moments who's memory would make me feel loved. Either that or always wear gloves like QEII. Perhaps the new King should give her a new pair of diamond hoops or studs that she can wear everyday instead of those stars. And as far as the rings go. She rarely wears rings, every now and then her wedding band. So her not wearing her rings was not surprising. If Letizia loves these star earrings, she should wear those as often as she wants. Letizia made yesterday a lovely gesture, by wearing her wedding earrings which she had got from king Juan Carlos and queen Sofia, and today wearing earrings she has got from Felipe. Anyone know what the blue ribbon with medal/jewel attachment is? Maybe the 2 stars represent Leonor & Sofia. I'm sure she has plenty to choose from,one thing Letizia is not short of is a few pairs of earrings but she just seems to wear the same old stuff time after time regardless of the ceremony or occasion. She Could have Worn her Wedding Band on the left Hand, like Felipe. No Problem with handshakes, then. The Star earrings are so Boring! This is my thought as well. I think they were a gift to mark something very special between them - maybe the birth of their daughters (I'm not sure when she started wearing them) or maybe something else that is just special to her and Felipe. Either way, the stars seem to hold great sentimental value for her to wear them today. We will never know. Personally I was hoping she would wear her wedding earrings again. Personally, I think it Letizia likes the star earrings or if they have a special meaning to her, there is nothing wrong in her wearing them everyday. Funny, nobody seems to complain about QE2 or Camilla wearing their regular pearl and diamond earrings on a day to day basis. 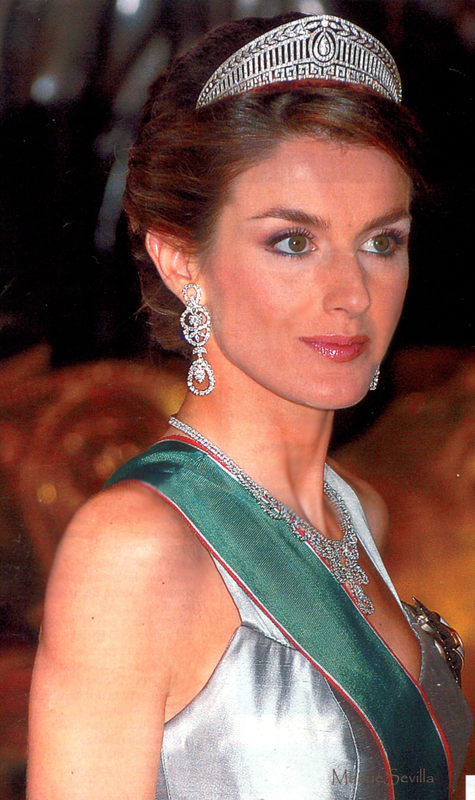 Day day to basis is fine but today Letizia became Queen Consort of Spain,the occasion warranted better attention to what jewels she wore and seeing as she now has the jewels of the Queens of Spain at her disposal her choice was lazy. I can understand how this momentous day can be overwhelming to someone like Letizia. On a conscious level you think you are ready, but on the subconscious? Just look how Maxima spent her day. She looked happy, but just a little overwhelmed by the whole occasion. She is going to look stunning in all of the tiaras now. I just hope that we get to see them more often. I can't blame her for choosing something comfortable on such a momentous day.